Do you remember playing in a sandbox? They were everywhere, from the parks, at school, and if we were lucky, in our backyards. These great toys allowed us to bring back a part of the beach experience that we all loved. Today’s sandboxes aren’t as “basic” as the ones we had. They come in intricate designs and incorporate various themes to make play more interactive and fun. In this article, we’ll be looking at some of the best sandboxes on the market, and how to keep them clean, among other advice. Use the links above to check the latest prices or read our in-depth sandbox reviews below. This is a question that lingers in the minds of many parents. They’ll shy away from public (and even private) sandboxes, due to the possibility of germs lurking in them. Parasites have been found in sand in daycare centers and other public play areas, mainly coming from animals. This is because the sand was left exposed (source). So, yes, you should keep your child away from such areas. Besides, public sandboxes expose your child to sweat, urine, saliva, and even mucus from those who were playing there before. If that doesn’t gross you out, I don’t know what will. Enough with public sandboxes or play areas. Today, we’re talking about your own private sandbox — the one in your home that you can take care of and keep safe for your kids to enjoy. Insects and small animals love playing in the sand, and who knows what germs they’ll deposit in the process. Keep the sandbox covered any time it’s not in use. Never let your pets play in the sandbox. They may mistake it for a litter box and use it to do their business. Gross. Wet sand can be a breeding ground for bacteria. Always dry it out completely before storing it. Debris can find its way into the sandbox, so rake the sand regularly to remove any foreign matter. And for your own sake, speak to your children about the above tips. If they know why you’re doing it, they’ll gladly help you. While you are at it, make sure the younger ones don’t put sand in their mouths. There are several types of sand that you can use for your sandbox; let’s take a look at some on the market today. This starts life as naturally occurring sand that comes from rocks which have broken down over millions of years. To make it safe, it’s washed to remove any lingering minerals that could stain the clothes and skin. It’s also blasted with water to remove any sharp edges, because it is rock after all. Once it’s dried, the sand is then safe for children’s use. It may be colored or left in its natural state (source). This type of sand is similar to regular sand but it has been coated with silicone oil to enhance its qualities. It comes in different colors, has a silky feel to it, and can be molded into any shape you want. One of the great things about kinetic sand is that it doesn’t stick to hands or surfaces but only to itself (source). These fun sands have different colors and textures. They fall into several categories and have been derived from various sources such as beaches, deserts, rocky mountains, and farms. All these sands are eco-friendly, dust-free, asthma and allergy-friendly, and safe for kids to play with (source). These colorful sands are non-toxic, moldable and feel like wet beach sand. The sand has amazing “magnetic” qualities that allow you to stretch, mold, and shape it whichever way you like. It does not leave stains and neither does it stick to surfaces (source). Playing with sand provides an unstructured play session where your kids are free to imagine and create freely. They can choose to scoop sand, mold it, build different objects, and anything else they can think of. This freedom makes way for your child to build developmental concepts. It also helps them understand mathematical concepts as they measure sand and pour it from one container to another. Additionally, all the digging, scooping, pouring, and general play will help develop their hand-eye coordination and fine motor skills. 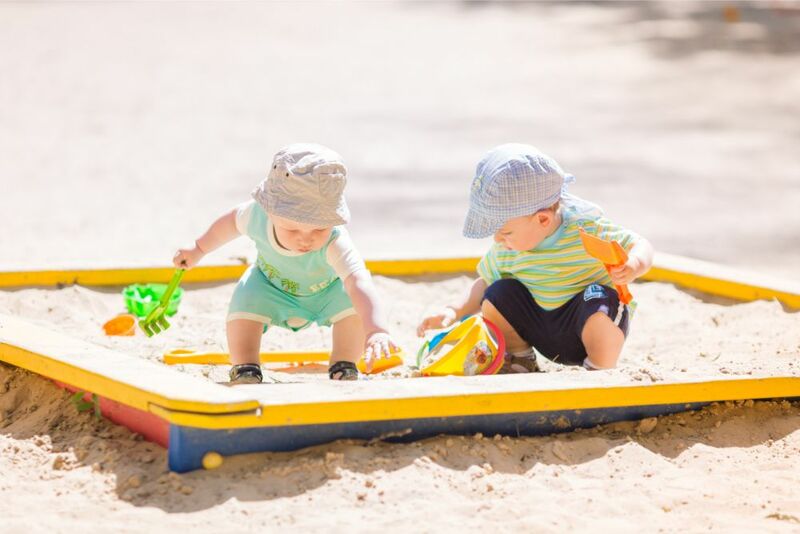 Sandboxes that allow multiple children to play together also encourage social skills. They’ll learn to share, negotiate, and compromise, and these skills will be further enhanced as they grow (source). Playtime will never be the same again with this elevated sandbox that brings together all the things that fascinate kids. We’re talking dinos, a rocky mountain, sand, and water — now what child (or adult) could resist that? 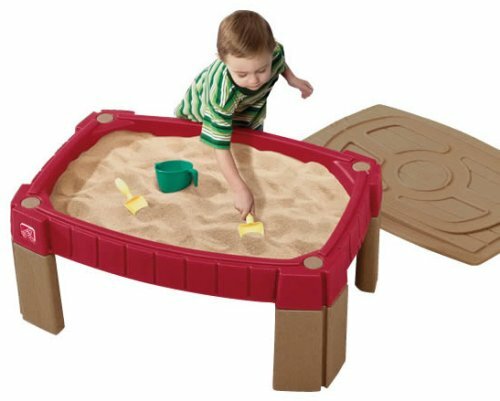 This sandbox measures 29.5 by 33 by 30 inches and features a two-sided table. The sand section holds up to 20 pounds of sand while the water basin can support 4 gallons of water. There’s a palm tree in the middle that gives it a tropical feel, and a watering hole for the dinos. The gray lid is designed to look like a volcano rock that can be incorporated into play. Your kids will enjoy pouring water into the high rocky mountain and watching it gush down the sides. The sandbox comes with four dinosaurs, a shovel/rake, and two scoops, to keep little hands busy and minds creative. The children can go off on an adventure to find the molded-in dinosaur bones and footprints. 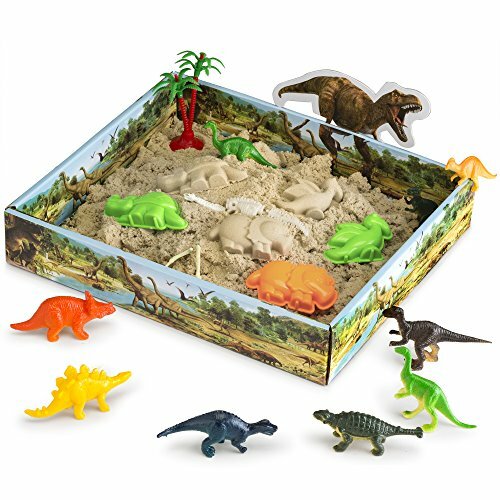 Once assembled, this sandbox gives off a prehistoric feel that takes us back thousands of years when dinos ruled the world. It’s a pure delight and will look great indoors or outdoors. Drain plug for easy emptying and cleaning. Large enough for multiple children to play. You can only use the lid to cover one side of the table, not both. Stuck indoors with nothing much to do? This dino sandbox is a great way to get your creativity going for hours on end. It’s ideal for dinosaur lovers, young or old. It features 1 pound of kinetic CoolSand, 10 mold shapes, 12 3D figures, a dino fossil, and other accessories. The packaging turns into the sandbox, measuring 11 inches by 9.5 inches, and is 2 inches deep. It has dino artwork all over, including the legendary T-rex, to help you create your own Jurassic Park. The CoolSand is particularly good since it doesn’t dry out or stick to you either. It holds its shape, which is great because you can mold it into just about anything. You can even choose to run your fingers through it for relaxation. Package contains plenty of accessories to enhance play. Includes non-stick CoolSand that is easy to shape. Less messy than ordinary sandboxes. The accessories may pose a hazard for children under 3 years old. Sandbox isn’t big enough for family play. This sandstone-colored sandbox offers plenty of room for your child and friends to play. Its ornate design will also look great in your backyard, especially if you have a rock garden or grass going on. It features four molded seats for the children to sit on while they engage in creative play. This sandbox is 11 inches deep and measures 28 by 42 inches, and holds up to 200 pounds of sand. It comes assembled, so all you need to do is pour in the sand and play time can begin. It’s made of durable plastic and has a full lid. This allows you to store the sand toys once the kids are done playing. Offers storage space for outdoor toys. Holds a lot of sand. Sitting space for four children. Lid helps keep the sand clean when not in use. The lid has issues latching well. For many years, children have enjoyed playing sand games in this smiling turtle, and so can yours. It’s made from high-quality plastic, designed to be long-lasting and will be a great addition to your yard. Grandparents can step up the fun by having it in their backyard for when their grandchildren come over to visit. The turtle’s shell doubles up as a removable lid, covering the sand area. 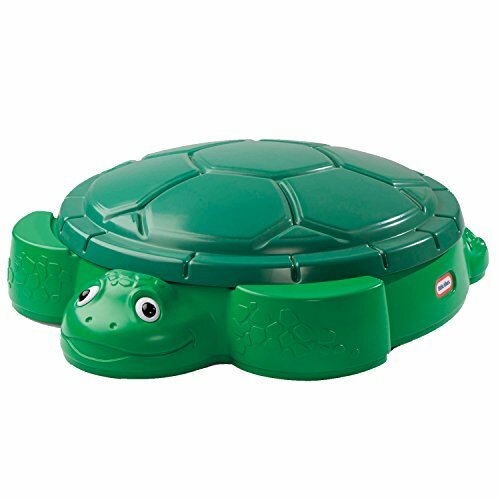 Once the kids are done playing, you can store all sand toys inside the turtle and snap shut the lid for protection. 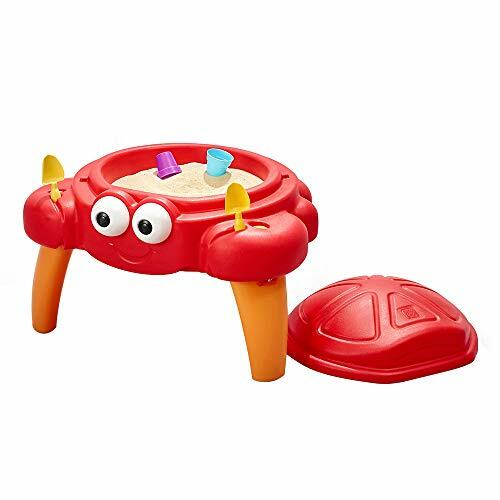 This circular sandbox is about 40 inches in diameter and offers a large play area for multiple children. It also features two seats for kids to sit on as they go about their sand business. These seats are molded on the outside to ensure they don’t eat into the play area. Speaking of which, the smiling turtle can hold up to 150 pounds of sand for your little ones to dig into. Big enough for several kids to play together. Turtle “feet” are handy seats. The lid doesn’t fasten shut, so could blow off the sandbox. This award-winning sand table was designed for younger children, to give them the opportunity to gradually get used to sand play. Its simple design and vibrant colors will look great, either in the yard or indoors. 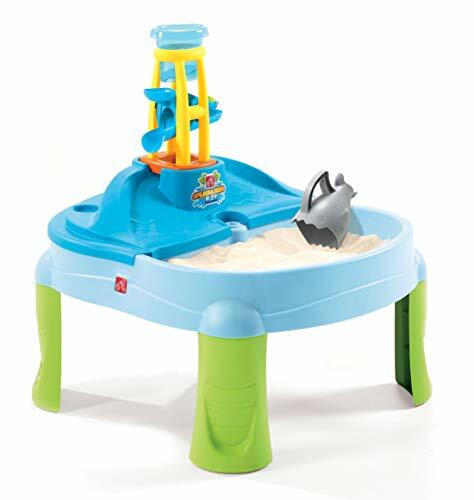 The 24-inch sandbox sits on three legs and is 22 inches high. It features a removable shell style lid that keeps the sand clean and dry after play. It can hold up to 25 pounds of sand which is just right for little hands to get creative with. From sand castles to tunnels, there’s no limit to how toddlers can play. Our friendly crabbie comes with two shovels and two buckets and is spacious enough for more than one child to play at. Suitable from age 18 months. Compact design, small enough to use indoors. Three legs might make it unstable. If you don’t want your kids trudging through or sitting in the sand, this may be a great choice for you. Four legs elevate the sandbox from the ground, which reduces the chance of animals getting into it. The play area is 26 by 36 inches and the table stands just over 16 inches high. 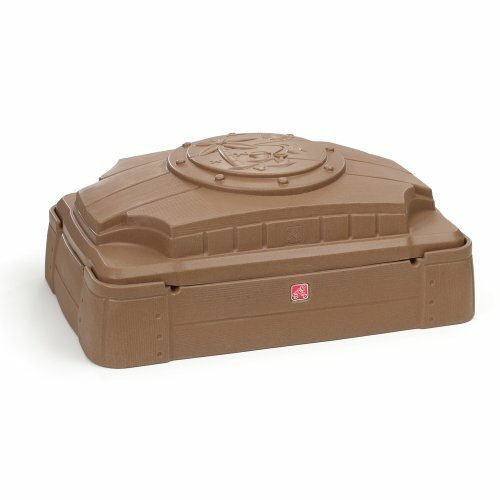 The lid keeps the sand safe from animals and debris. It also comes with elastic straps to secure it in place. Plus, it doubles up as a racetrack for cars and trucks, which is great should your child tire of the sand play. This sandbox can hold up to 40 pounds of sand and comes with accessories, including two claw rakes, two shovels, and one bucket. It comes unassembled, but is easy to put together. Elastic straps hold the lid in place. Lid doubles up as a play table. No seal on the cover, so rainwater might be able to seep in. Sand plus water equals more fun for kids. This sandbox gives you the best of both worlds without compromising on quality. One section of the sandbox holds sand, while the other has a water tower attachment, complete with a water basin. The lid is designed to look like a mountain that can be combined with the tower to create a waterfall. This sandbox comes with a shark scoop and shovel/rake. It holds a maximum of 3 gallons of water and 30 pounds of sand. Additionally, there’s a drain plug for easy cleanup. The table is 29.5 inches high and the play area measures 31 by 28.25 inches. The cover fits either side. Fun accessories for added play. Lid only covers one side. Sun shade must be bought separately. If your child isn’t thrilled by simply playing in the sand, step up the fun using this construction-themed sandbox. Along with the play, kids will be engaged in strategic thinking as they figure out how to operate heavy machinery. The lid serves as a ramp for the heavy equipment to come on board the sandbox. 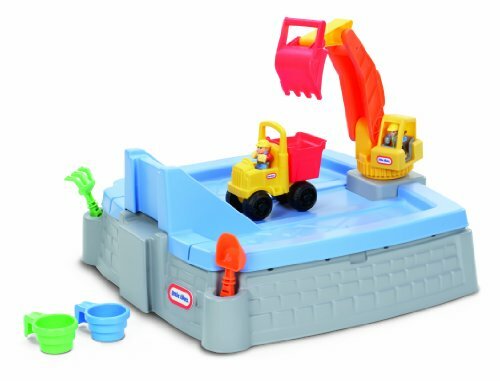 This sandbox comes with an excavator, dump truck, two characters, rake, shovel, and sand cups. The length is around 51 inches when the lid is being used, and it’s 28.5 inches wide. Big digger has a holding capacity of 100 pounds of sand. Children will have tons of fun building castles, roads, tunnels, and whatever else their brilliant minds can come up with. So, how about assembling this toy and getting your young builder started? Boosts strategic thinking and fine motor skills. Pockets for storing the accessories. The lid may collect water. The sandbox is quite small. 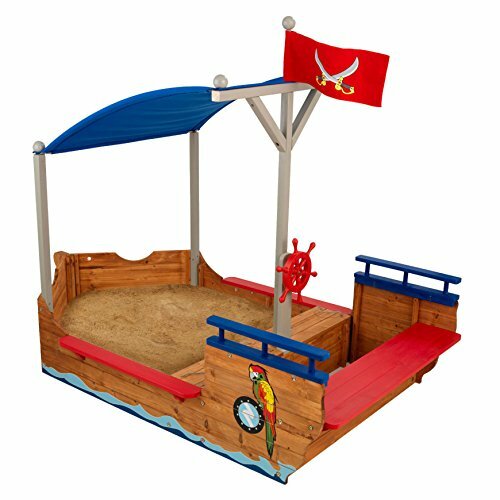 Children love dressing up and playing pirates, so why not make your child’s dreams come true with a pirate ship sandbox? This delightful sandbox comes with a steering wheel, flag, and other colorful pirate-themed artwork. It features two compartments. One compartment holds the sand for the children to play in, while the other provides seating space. In between, there’s covered storage for the sand toys. The sandbox itself is 38.5 inches wide by 48 inches long, and the total length is 78.5 inches. It holds up to 700 pounds of sand! The sandbox can accommodate several children and there’s a shady canopy to shelter the little pirates from the sun. The product is made from sanmu wood and comes unassembled, but with detailed instructions to help you set it up. Pirate theme that inspires creative play. Canopy to keep the sun out. Includes a plastic liner for the sand. Spacious area for several children to play. The cover doesn’t fully enclose the sandbox compartment. 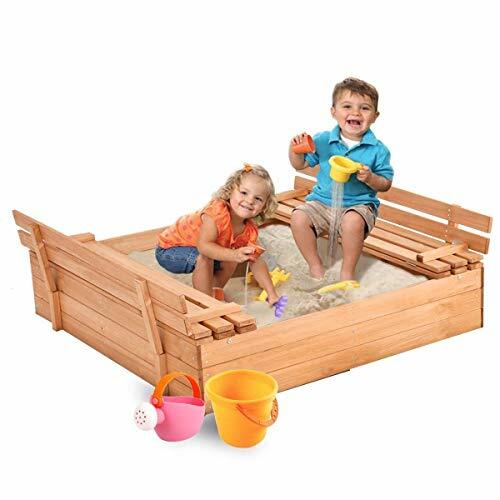 This wooden sandbox is a great option for one or more kids to play in. It’s built using heavy-duty fir wood and finished with non-toxic paint. It features folding benches for kids to rest on, or acts as an expanded play area for their other toys. The foldable benches double up as the lid. Once playtime is over, simply fold them so they lie flat over the sandbox. This helps to keep it safe from unwelcome animals or debris. Each bench can accommodate up to 200 pounds in weight, and the sandbox holds at least 450 pounds of sand. It’s bottomless, which allows you to increase sand depth, especially if it’s placed on a lawn. The manufacturer has included a non-woven fabric cloth that can be used as a base under the sand. This sandbox comes in three different sizes, from 41-inch to 55-inch. The largest size has a canopy to keep the sun out. Bottomless construction allows you to increase sand depth. Easy cleanup that only requires you to fold the benches. Large sandbox accommodates several children at once. Even the smallest size is heavy. No solid base under the sandbox. Lid is slatted, so doesn’t keep rain or insects out. Having a sandbox at home is a lot of fun and relaxing as well; it brings the beach to your kids! 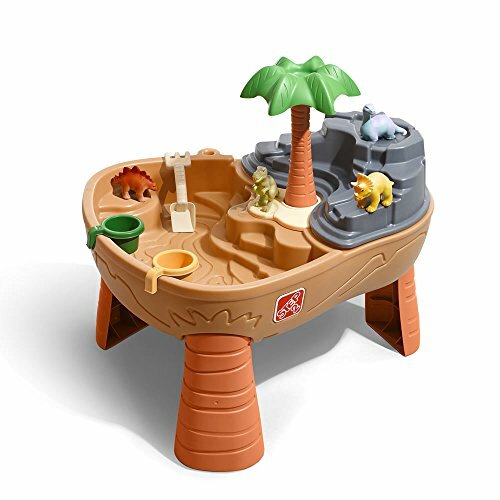 My favorite sandbox is the Step2 Dino Dig sand & water table. It’s eye-catching and fun, offers tons of adventurous play for kids, and they get a lesson in history. Choose the best sandbox to match your space and the interests of your children. Look out for products that are durable and which will keep the sand clean; we don’t have to tell you how important that is. Do you have a favorite sandbox? Let us know in the comments, and please remember to share.